PC gaming specialist Razer is taking its gorgeous gaming peripherals to a whole new platform, with the announcement of a headset and a controller for the Xbox 360. Razer's peripherals have long been desired by PC gamers, and the Xbox peripherals certainly look like they could do the same for Xbox 360 owners. "Just as we did for PC gamers, we are really looking forward to revolutionizing the world of console gaming by creating a controller and gaming headset that gives console gamers the same level of quality, precision and accuracy that they know and expect in our PC products," said Robert "Razerguy" Krakoff, president, Razer USA. "This is a great opportunity for us to continue to give gamers the competitive edge by really listening and responding to their needs." 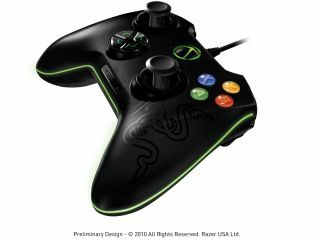 The Razer Onza will feature Razer Hyperesponse buttons, analog sticks with customizable tension and a programmable multi-function button (MFB). The Razer Chimaera is equipped with a 5.1 Channel Virtual Surround sound system, a Daisy-Chain cable system and a 'circumaural' design for optimum sound quality and comfort. "These releases promise to be an exciting new endeavour as Razer makes its much anticipated debut into the world of console gaming," says Razer's release. The controller is going to cost €44 - so probably £40 when it arrives in Europe, with the headset at a €109 - so a shade under £100.